This just in from the “Take a vote, not a vacation” files. More people have enrolled in Medicaid’s expansion in less than four months than were expected to sign up in the entire first year of the program, the Snyder administration announced Thursday. The expansion, called the Healthy Michigan Plan [click HERE], opened April 1 with a first-year goal of 322,000 sign-ups. The state said it exceeded that projection Thursday with more than 323,022 residents enrolled. The Michigan Department of Community Health estimated 477,000 Michiganians would sign up by the end of 2015. The Healthy Michigan Plan opens the federal health insurance program for the poor to all adults with incomes up to 133 percent of the poverty level, or $30,000 a year for a family of four, as allowed under the federal Affordable Care Act. 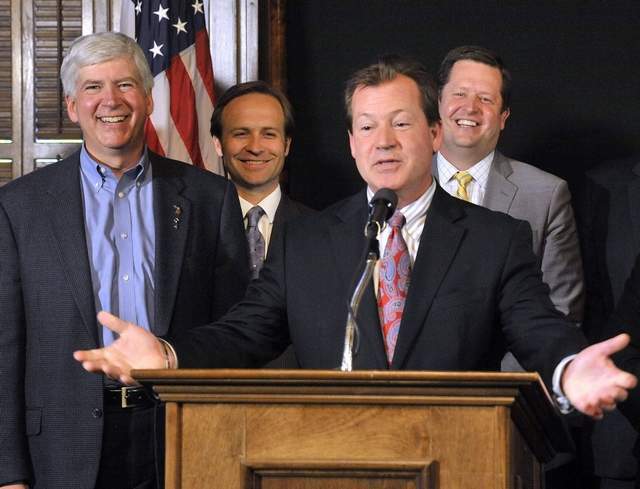 Snyder was among a small group of Republican governors who broke with party lines to support expanding Medicaid under the Affordable Care Act. He waged a bitter battle with Michigan’s Republican-controlled House and Senate to push the measure through last year. What’s this? Karen Bouffard didn’t include the part about being forced into estate confiscation? Nah, I don’t think that would be a selling point for her propaganda. Anyhoo, congratulations on Public Act 107 of 2013, ya bunch of Obama enabling Nerdpublicrat fools, and yes, that includes these two “conservative” frauds, too. Yikes, odsbodlikins, jeepers and all that jazz. If you think that's bad, wait until you see what'll happen with the post I'm working on.